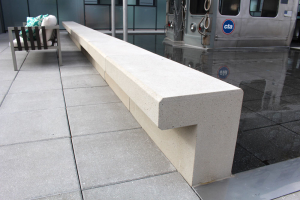 At Doty & Sons we manufacture a complete line of concrete benches and other site furniture. 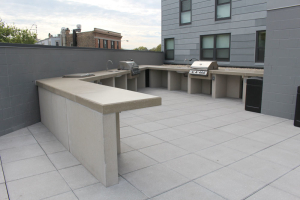 We work with architects and designers on custom products. Sometimes we are asked to create odd shaped products. Products that are a little out of the norm. 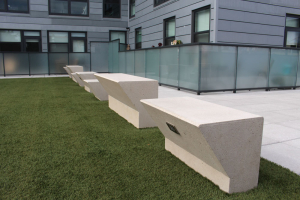 Last year we were asked by a landscape architect if we could make benches that looked like smooth stones. Something you find on a beach, but much larger. 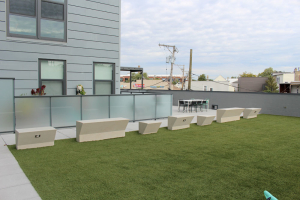 The benches were for an outdoor classroom project at an elementary school. 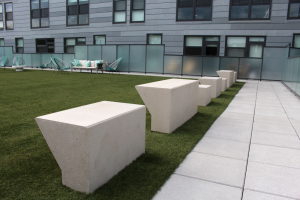 We were asked to create three stones of different shapes and sizes. The challenge was, what type of form would be used to make the shapes. We decided that a combination rubber and fiberglass forms would create the smooth, irregular surface without form lines. 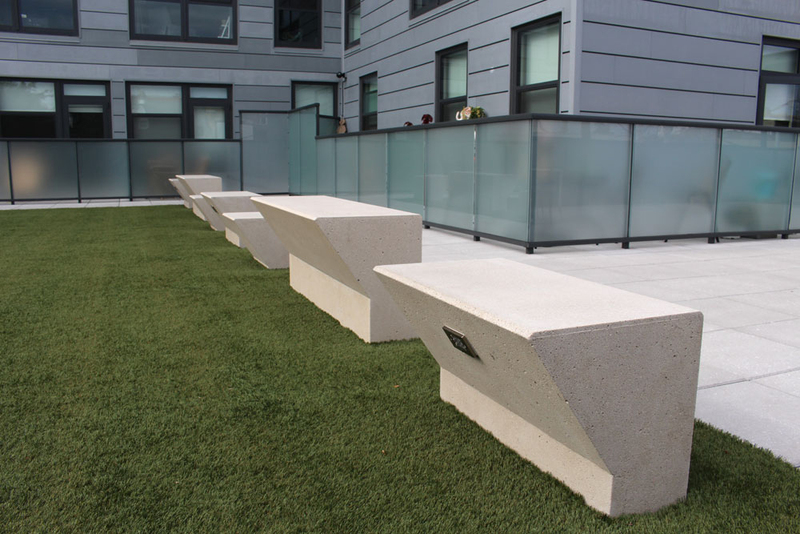 The “stone” benches are shown here. The large stone (shown in back) is 52″ x 24″ X 10″, weighs 932 lbs. and cast in Kahlua color. 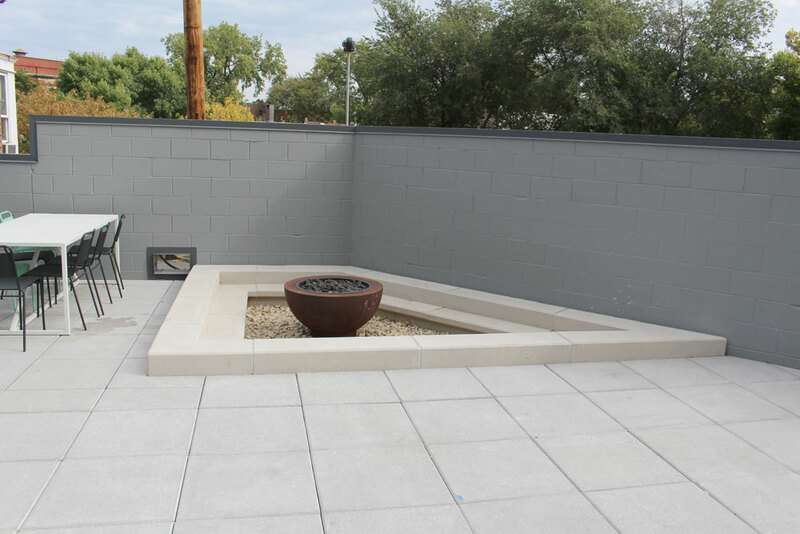 The medium stone (front) is 41″ X 14″ X 9″, weighs 305 lbs and cast in Mesa buff color. 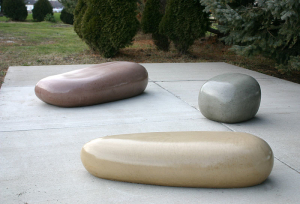 The small stone (center) is 18″ x 19″ x 13″, weighs 352 lbs and cast in French gray color. All the stones were sealed with a semi-gloss water based sealer. 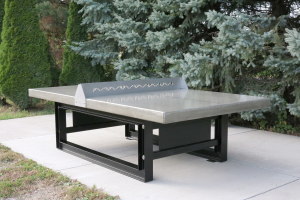 Outdoor Concrete Ping Pong/Tennis Table with steel base. Doty & Sons has introduced a new concrete ping pong/tennis table to their product line. 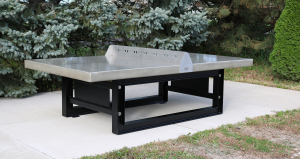 This table, Item T1086035, has a concrete top with a heavy duty steel frame. The table features a 4″ thick regulation size table top. This top is 33% thicker than most tables on the market. 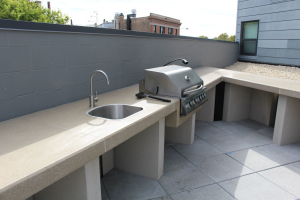 The top is polished and sealed with two coats of concrete sealer. For added protection we top coat the table is Anti-graffiti sealer by Coval http://covalmolecular.com/products/coval-graffiti/. This is one of best anti-graffiti sealers on the market today. 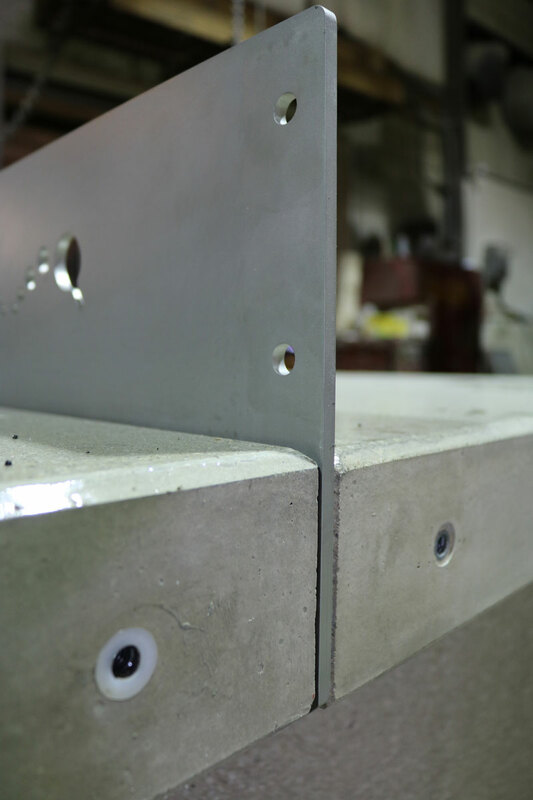 The outside edges are chamfered to eliminate a sharp edge. 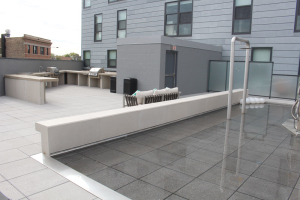 Another feature that sets this table apart from others, is the heavy duty stainless steel net. The net is 1/4″ thick and 10″ tall. 4″ is “sandwiched between the table tops section. 6″ is above, which is regulation height. For added support we add stainless steel gusseted end supports. The net is assembled with stainless steel tamper resistant hardware. The steel base is 72″ X 48″ X 26″ H. made with steel I-Beam construction. This is heavy duty! The base is powder coated in a 2 step process. The first coat is a zinc rich base coat. The base is finished coated with your choice of many colors. The frame is assembled the 1” diameter stainless steel bolts. 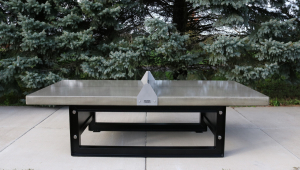 Concrete Ping Pong Table with heavy duty metal frame. Outdoor Ping Pong Table with metal frame. Side view. 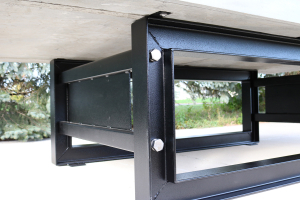 Close up view of metal frame. Close up view showing concrete top, frame and net. Close up view showing the stainless steel net “sandwiched” between the table top sections. Note the gusset end was removed for illustration purposes. T1086035 Concrete/steel ping pong table right side view. 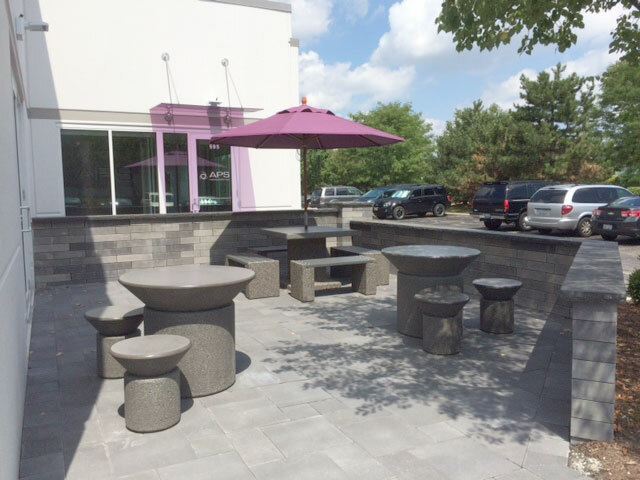 Concrete tables for employee break area patio. 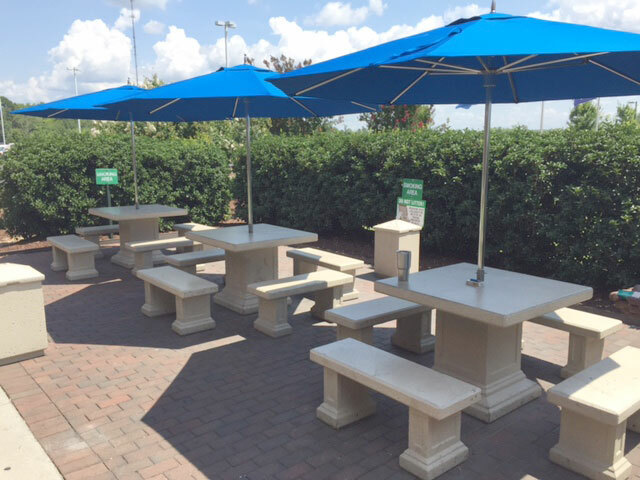 In July 2016, we shipped tables and cigarette disposal containers to Gestamp’s production plant in Union, South Carolina. 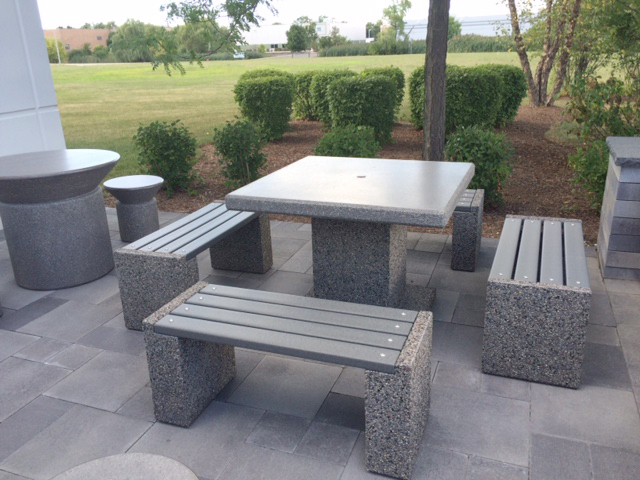 The tables, Item T7400, are being used for an outdoor break area for the company’s employees. The T7400 is the “Morrison Style” table set. The tables feature a polished table top with stainless steel umbrella coupler and holder for umbrellas. 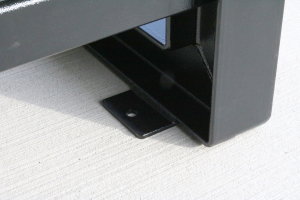 The “Morrison Style” is a tradition style that features indented side panels, dentiles and molded bottom edge. 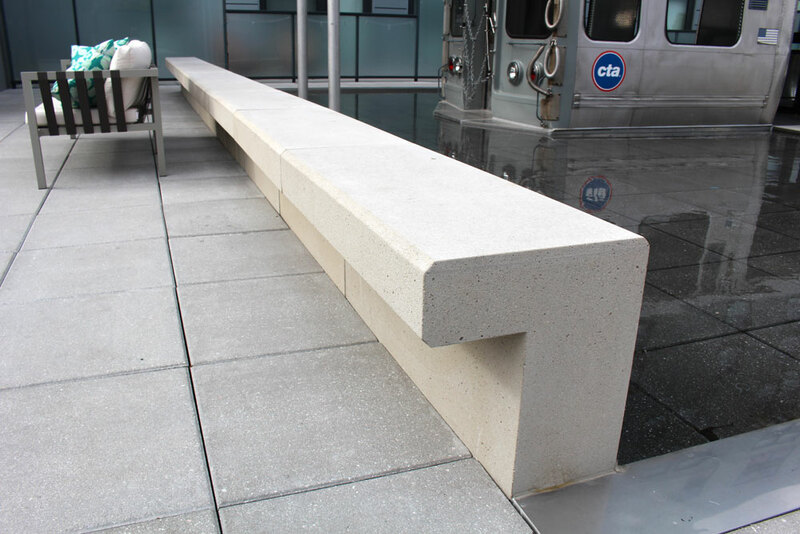 Gestamp chose the C2 finish, which is a limestone color light sandblast finish. The accompanying photographs display how well the products fit the space. 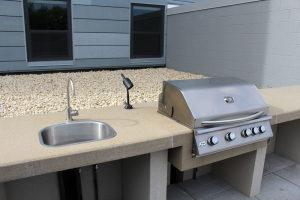 “We are very pleased with our purchase,” remarked Henry Watkins of Gestamp. We ship to all points in the United States. Our centralized location, in Illinois, allows us to ship to most locations at reasonable rates. Table sets. Morrison Style Item No.T7400. Concrete table set shown on patio at Gestamp, Inc. 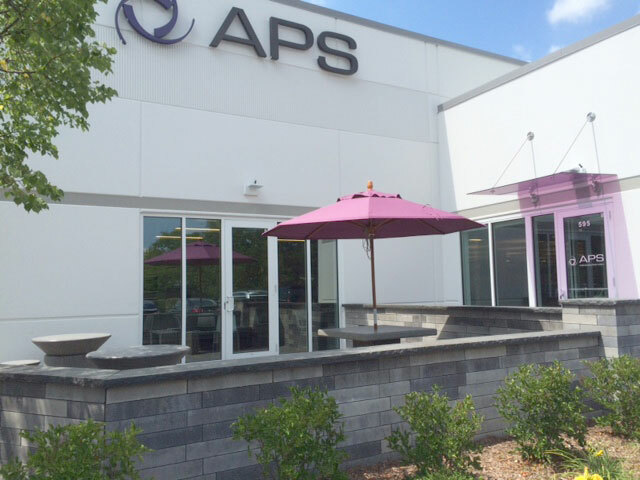 Earlier this summer Aircraft Propeller Service (APS) located in Lake Zurich, IL. purchased tables from Doty & Sons. They were looking for tables that would fit nicely on their newly build patio area. APS selected 2 styles. 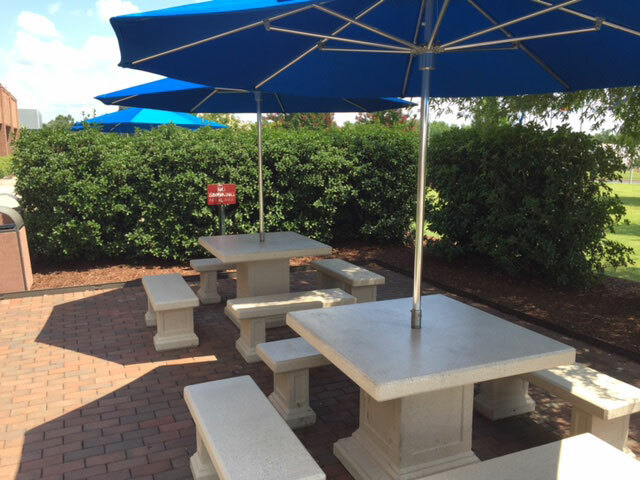 One style is Item T6710 which is a square table with 4 benches. 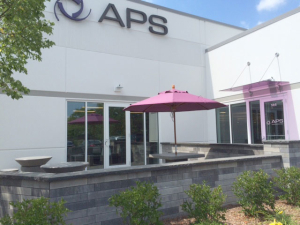 APS selected a granite aggregate with pigmented concrete SB8 and EX8 finish. 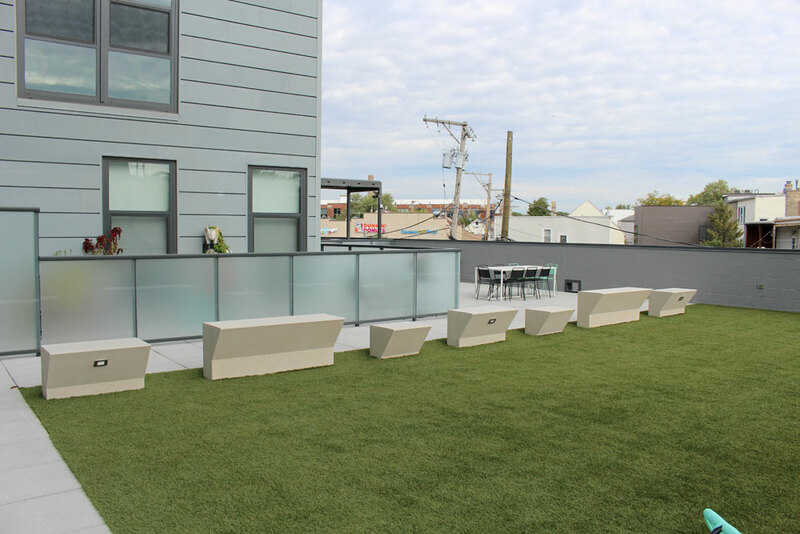 The seats are a grey recycled plastic lumber. The second table is a modern design T7500 table set we call the “Venez” table. This sleek design is different than most table sets. The tables, although totally different in design and look, go well on the patio. APS later added umbrellas to the tables. A special color was selected from a large choice offered by our supplier Treasure Gardens. T6710 and T7500 Tables sets shown on site at APS. T6710 shown in SB8 and EX8. Gray color recycle plastic lumber seats. 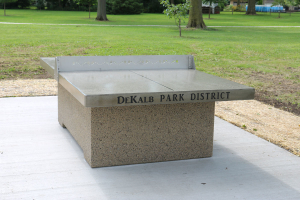 DeKalb Park District recently ordered a new ping pong table for their park. 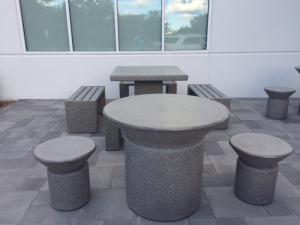 The table Item T1086030 was cast in the “Stealth” Gray color with granite aggregate top and SB11 (sandblasted, natural color with granite aggregate) base. Each end included DeKalb Park District’s name contrast sandblasted and painted. The table top is polished and sealed with 2 coats of gloss sealer. A top coat of graffiti sealer is than applied. We recently painted the front of our building and replaced the sign with our new Doty & Sons logo. We have a photograph of Cal and LaVern Doty standing in front of the building. The photograph was taken in 1971. This photograph also appears on the home page of our web site. On August 13th we recreated the photograph showing the newly painted building and sign. Another photograph includes Eric Doty who plans on continuing the business a 3rd generation. We are proud of our business and the fact that we are a manufacturing business. 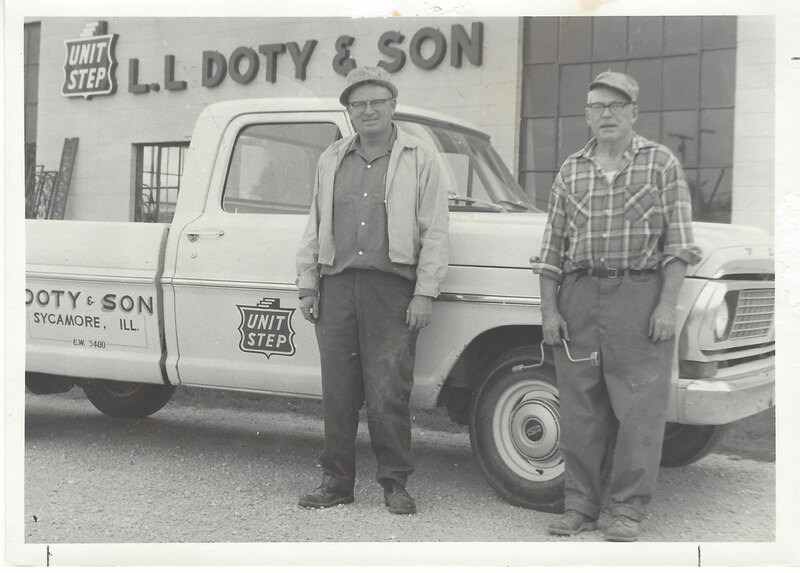 Cal and LeVern Doty started the business in 1948. They built a reputation of making quality products and providing good service to their customers. Sixty-Eight (68) years later we are upholding that reputation. 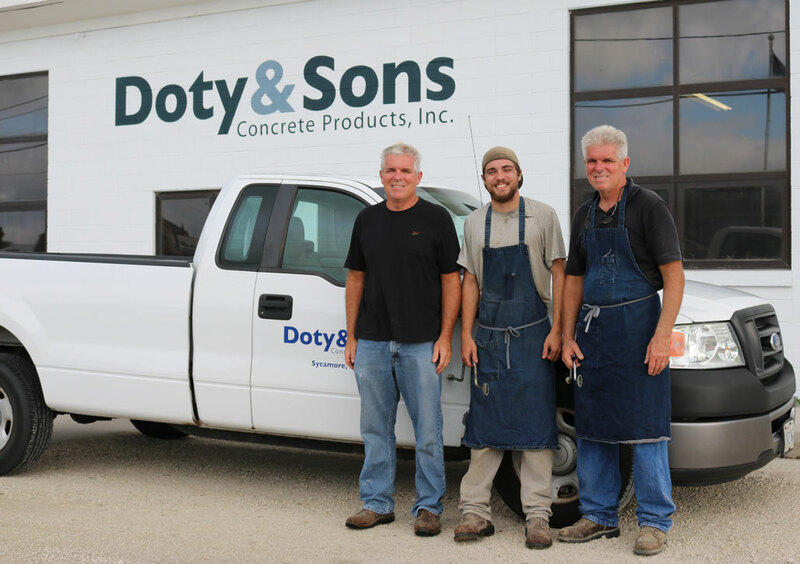 Doty & Sons was honored and excited to work with the Portland Cement Association to commemorate their 100th anniversary. 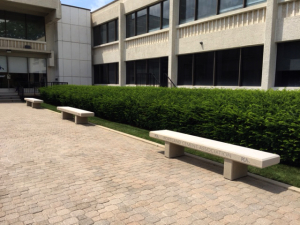 We manufactured benches for the PCA headquarters in Skokie, IL. 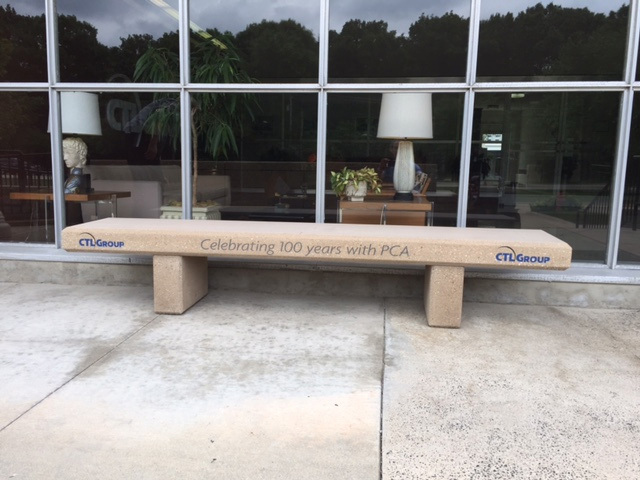 PCA selected the large Plaza Style(Item B5200). 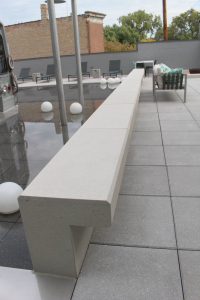 This bench is 96″ Long x 18″ Wide x 17″ High. 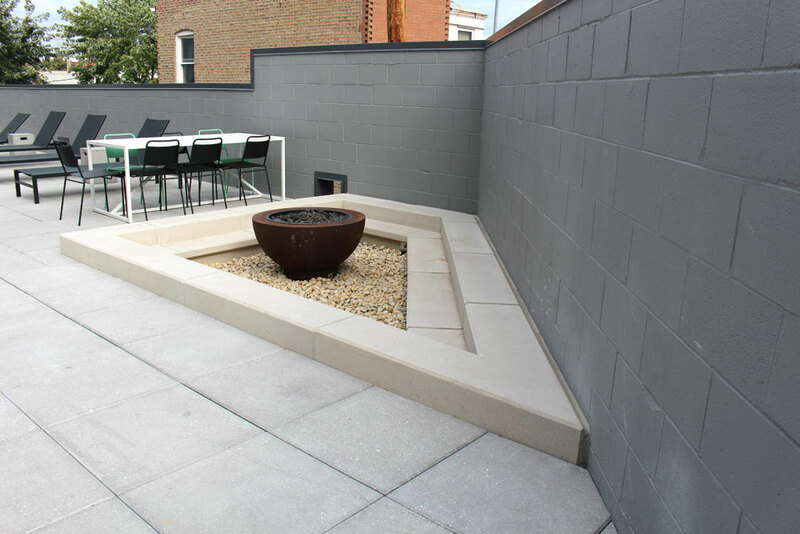 PCA selected C2 finish, which is a light sandblast limestone color. 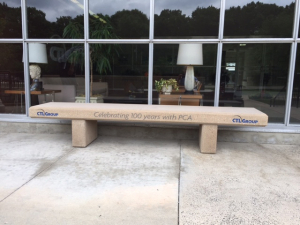 The bench seats were polished and we contrasted sandblasted the benches with PCA’s selected inscription and logo. PCA also selected bench B722418, which were placed on the campus back to back as shown in the photograph. B5200 Benches shown at Portland Cement Association campus. 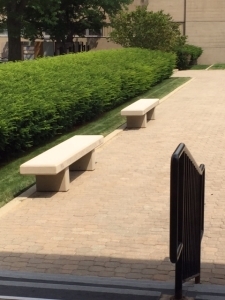 B5200 benches. Shown in C2 finish with contrast sandblast logo and inscription. 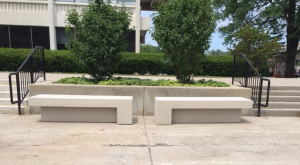 B722418 Benches back to back on PCA campus. 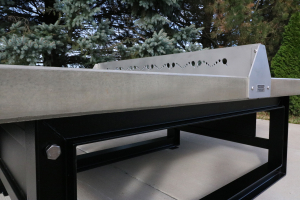 Doty & Sons also manufactured a bench the CTL Group which is on the same campus as Portland Cement Association. 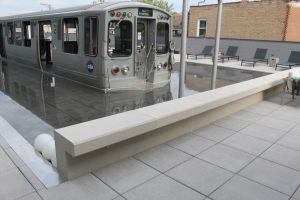 We customized the finish to match the color of the building and included a sandblasted inscription and CTL Group’s logo. 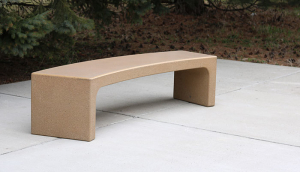 B5200 Bench with CTL logo. 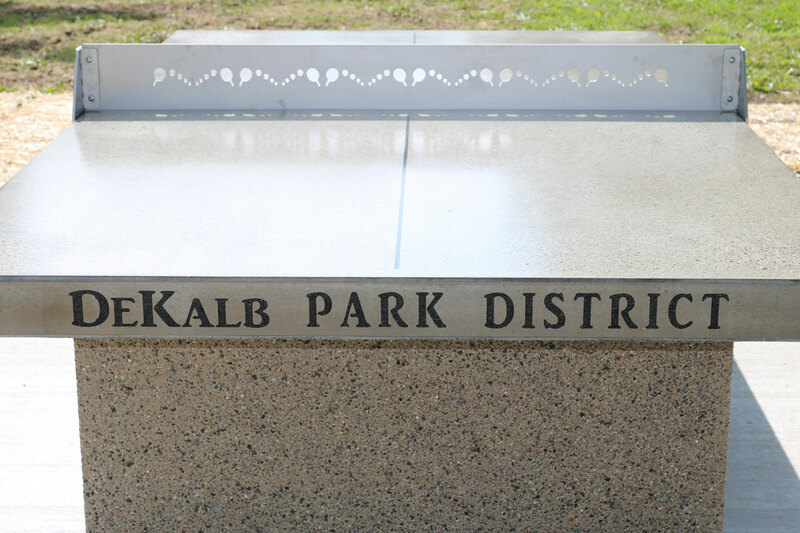 This article appeared in DeKalb Chronicle and The MidWeek newspapers. Written by Katie Smith. 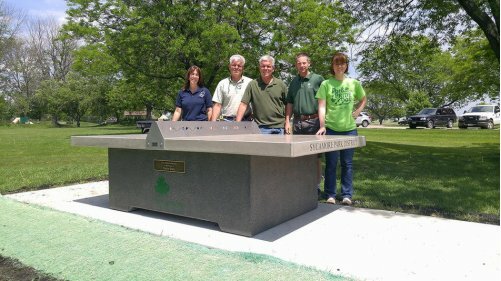 SYCAMORE – A donation to the city’s park district has sparked friendly competition among parkgoers. Twin brothers, Sam and Tom Doty of Doty and Sons Concrete, 1275 E. State St., Sycamore, donated a concrete, outdoor table tennis table of their own creation to the Park District. Attached to the table is a memorial plaque, commemorating their father, former Sycamore businessman Calvin Doty, who died in 2014. 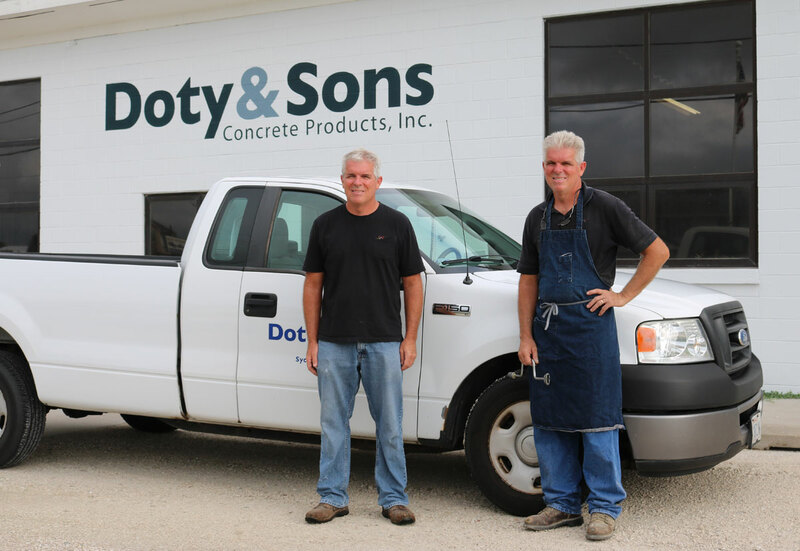 Calvin Doty and his father, Lavern, started Doty & Son Concrete products in 1948. Throughout his life, Calvin Doty delivered mail for the Post Office, worked construction, and served as a medic in the United States Army. A memorial scholarship fund wascreated in his name last year. 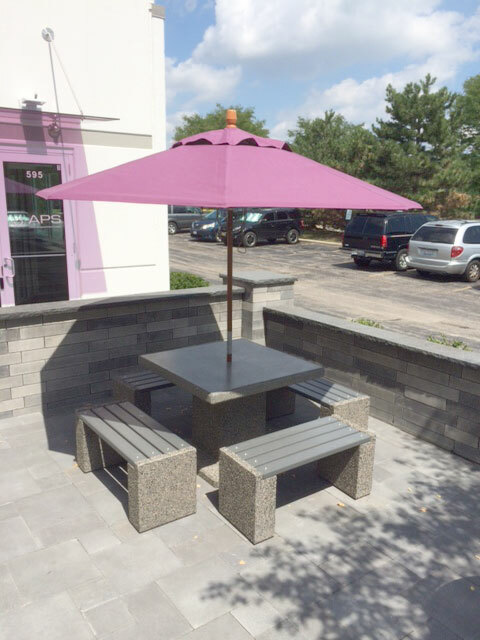 The table is one of Doty and Sons’ newest creations, and is currently being manufactured alongside the company’s benches, tables, and planting pots, which also furnish the Park District’s grounds. The game has been placed near the Good Tymes Shelter in the Sycamore Park District sports complex, where it is surrounded by a sand volleyball court, horseshoe pit, pond walking trail, and playground. 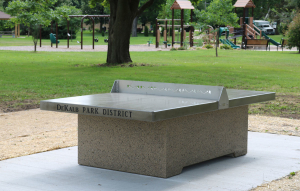 “The table not only adds a new, unique way to enjoy the park, it’s a work of art in itself with the District logo and memorial plaque on beautifully crafted concrete,” Superintendent of Parks and Facilities Jeff Donahoe said in a news release. 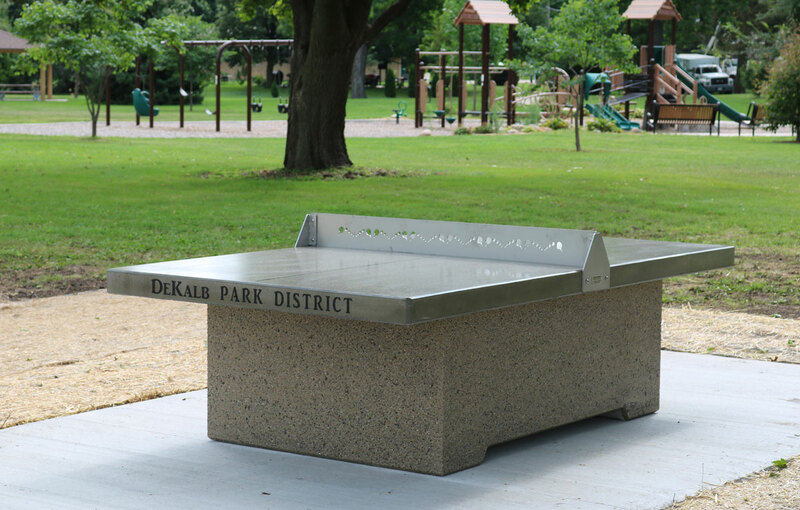 Throughout the Summer Concert Series, the Park District will offer outdoor table tennis paddles and balls, available for checkout during the shows. 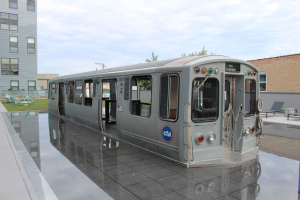 “It’s a good place for people to use it, and I know they were using it one of the first nights,” Sam Doty said. New custom curved bench. Size: 74 3/4″ Wide x 18″ Deep and 17″ High. Weight 525 lbs. Finish shown: SB2. 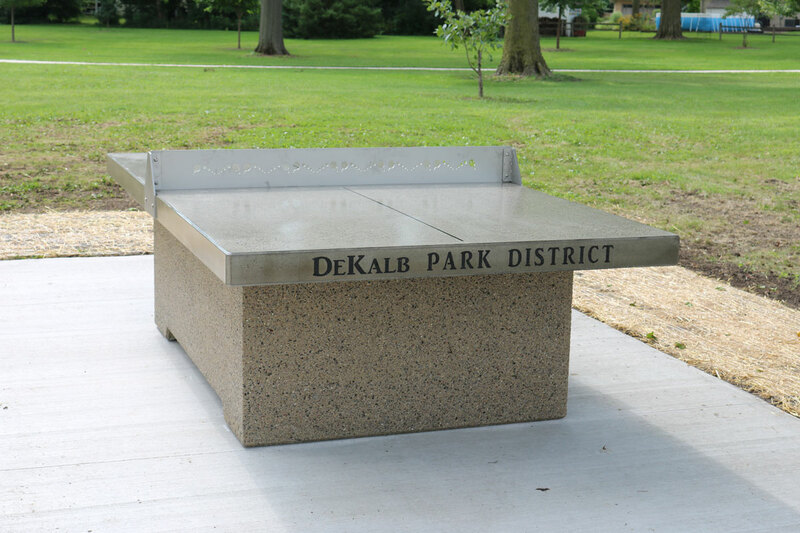 Outside arc of the bench is 144″ or a 24 foot diameter circle. 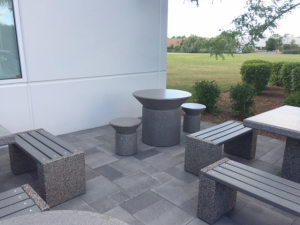 Doty & Sons fabricated the forms and cast 18 benches for a customer in the Bahamas. This bench has now been added to our product line, the Item number is B5975.